I don’t have a whole lot to add to what’s been said by Conor Friedersdorf, Peter Beinert, and Michael Tomasky about the Chris Hayes flap. My instinct is to say nothing in the hopes that it fades quickly, but since it’s still being debated, I guess I might as well weigh in. I would guess that anyone who knows my work knows that I’m not one who thinks that Hayes said anything untoward. He’s an intellectual who hosts an unusually thoughtful show on week-end mornings for people who like to watch unusually thoughtful conversation on TV. I feature a segment or two every week on my blog and have touted his new book numerous times. This week, most of the discussion centered on the social distance between the realities of war and the people back home and between those who are part of military culture and those who aren’t. His comments about “heroism” were a small part of the entire conversation, all of which was extremely respectful. Also read Erik Kain on why Chris Hayes is right about heroes. But it does raise a question in my mind about “social distance.” Chris apologized saying that he “sounded like a typical out-of-touch pundit seeking to discuss the civilian-military divide and the social distance between those who fight and those who don’t, I ended up reinforcing it, conforming to a stereotype of a removed pundit whose views are not anchored in the very real and very wrenching experience of this long decade of war. And for that I am truly sorry.” I’ve always thought this “social distance” was a useful thesis, helping to explain why the Villagers are so out of touch with the average person. But what I hadn’t reckoned with until now is a sort of tyranny of “walking the walk” that results once you acknowledge it. All citizens have a right and an obligation to participate fully in American civic life. If we are now going to say that those who haven’t “walked in the shoes” of whomever is directly affected by a policy are not sanctioned to have an opinion, we are essentially saying that we are only responsible to ourselves rather than the body politic. It becomes a fragmented sort of social responsibility in which we substitute experience and expertise for democratic participation. And the truth is that Hayes may have a social distance from those in the military, but he was speaking for plenty of those who don’t. 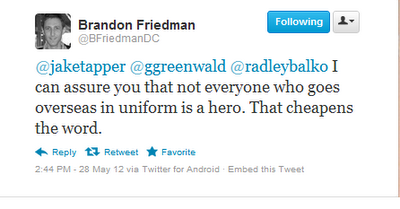 Brandon Friedman is a writer, veteran, and civil servant. He is the author of the combat memoir The War I Always Wanted and currently serves as the Director of Online Communications for the United States Department of Veterans Affairs. Friedman is a Fellow with the Truman National Security Project. Or, you could listen to retired Colonel Andrew Bacevich. Or my right wing career military father (and veteran of two wars) who winced at all the reflexive “thank you for your service” comments that became the vogue after the Iraq invasion. Hayes may have “social distance” from military culture but he didn’t say anything that plenty of veterans don’t say every day. He wasn’t speaking from the perspective of a wealthy Villager who pretends she is just an ordinary WalMart shopper who speaks for Real Americans when she demands “sacrifices”—he really was speaking for millions of Americans. Unfortunately, we are rapidly turning into a society in which the only people who are not subject to the bludgeon of “military correctness” is the military. And that’s not healthy. Ironically, Chris Hayes’ example shows that in an odd way, acknowledging the “social distance” that makes many elite pundits and analysts out of touch with average Americans may just be leading to a different sort of elitism. And judging from his body of work, I’m fairly sure that’s the last thing he intends to do. Heather Digby Parton is guest blogging this week while Kevin Drum is on vacation.